Evacuees walk inside an evacuation center as rains from Typhoon Mangkhut begin to affect Tuguegarao city, Cagayan province, northeastern Philippines on Friday, Sept. 14, 2018. Typhoon Mangkhut retained its ferocious strength and slightly shifted toward more densely populated coastal provinces on Friday as it barreled closer to the northeastern Philippines, where a massive evacuation was underway. 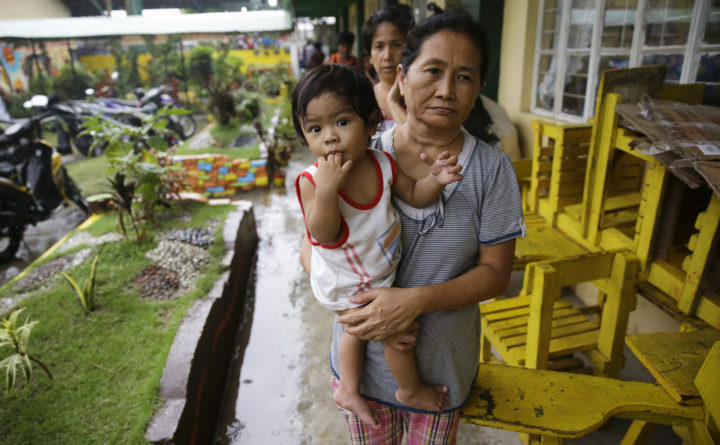 TUGUEGARAO, Philippines — Typhoon Mangkhut slammed into the country’s northeastern coast early Saturday, with witnesses saying the storm’s ferocious wind and blinding rain ripped off tin roof sheets and knocked out power at the start of the onslaught. With a huge rain cloud band 560 miles wide, combined with seasonal monsoon rains, the typhoon was expected to bring intense rain that could set off landslides and flash floods. Storm warnings have been raised in almost all the provinces across the Luzon, including the capital, Manila, restricting sea and air travel. Before it hit the island, Mangkhut was tracked late Friday with sustained winds of 127 miles per hour and gusts of up to 158 mph, forecasters said. A super typhoon wrought heavy damage to Banez’s hotel and the rest of Cagayan in 2016. After the Philippines, the Hong Kong Observatory predicts Mangkhut will plow into the Chinese mainland early Monday south of Hong Kong and north of the island province of Hainan. Though it is likely to weaken from a super typhoon to a severe typhoon, it will still pack sustained winds of 109 mph, it said.